80% prebuilt for modelers who are totally ready to fly! For aviators anxious to be airborne, the Cessna 180 offers a bee-line to the flight line. Designed for simply assembly and easy progress, it takes only a few hours to complete, and no time at all to finish. Covering and painting aren’t required and colorful decals are already applied. Fast, easy assembly and gentle handling make it ideal for the first-time flier, but its size and unexpectedly strong electric performance also make it an experienced pilot’s pick for a fun park flier. Tough, all-foam fuselage and band-on wing go together in minutes, eliminating most building time. Avoids the bare, boxy look of stick-built trainers with smooth, molded contours and decal-provided details. Factory-installed 550 motor and direct drive speed assembly provide clean, quiet flight power. 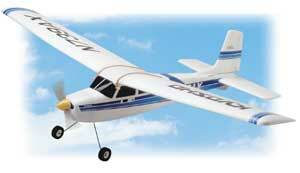 High-wing design and flat-bottom, Clark “Y” airfoil maximize stability and lift even at low flight speeds. Elevator and rudder control simplifies control for first-timers, yet offers experienced pilots ample versatility for gentle loops and rolls. Can be equipped with an inexpensive auto cut-off to ensure control power at low battery levels, or an ESC w/cut-off to control motor speed and conserve battery power.